Wednesday afternoon, the “Zen Master” showed us once again why he earned such a prestigious nickname. Don’t know what I’m talking about? That’s okay, I’m going to fill you in. Who needs ESPN when you have DaveTalksSports right?? Phil Jackson made a splash yesterday by making his first trade as New York Knickerbockers President. You would be hard pressed to find some one with a brain to tell you this was a bad deal for the Knicks. The Knicks will be shipping Tyson Chandler back to the Dallas Mavericks along with Raymond Felton for Jose Calderon, Samuel Dalembert, Shane Larkin, Wayne Ellington, and 2 2nd round picks (34th and 51st) in tonight’s draft. For starters, I can’t believe the Knicks were able to offload Raymond Felton (Hey Ray, don’t forget to register those guns in Texas…..oh what it’s Texas, never mind). The Knicks get a definitive upgrade at the point guard position in acquiring Calderon. Calderon is going to do exactly what a “true” point guard is supposed to do. He is going to manage the floor, limit turnovers, knock down the open 3-pointer (which he showed he can certainly do), and most importantly keep the ball out of Carmelo Anthony’s hands (assuming Melo is still on the Knicks next season). The other thing that most people probably don’t realize is that Calderon is one of the best free throw shooters in the NBA. Now, you’re probably saying that’s not a big deal, but when you think about it, clutch free throw shooting is often the difference between winning and losing. The Knicks do commit to Calderon for 3 years seeing as he is under contract, but this is the type of point guard Phil Jackson wants in his “Triangle” system anyway, thus making the $8 million per year easier to swallow. The Knicks do take an obvious downgrade at the center position by bringing in Dalembert, but he can play some semblance of defense and give you 8 points and 8 rebounds on a consistent basis. And most importantly, he is an expiring contract. Even if Tyson Chandler goes back to Dallas and returns to his 2011 form, the Knicks still cleared his $15 million from the salary cap. As for Larkin and Ellington, these are 2 young players that could turn in to solid role players. They are in the wait and see category, which is exactly what this Knicks franchise NEEDS!! Rebuilding while also having a solid foundation if Melo comes back?!?! Who could have thunk up that genius idea? Now that Phil Jackson has gotten his feet wet, I am excited to see what he does with his 2 draft picks this evening. This is easily the best part of this trade by the way. No, it’s not that the Knicks are going to find the next Michael Jordan with the 34th or 51st pick, but it is the concept of draft picks that I love. That sounds silly to say, but if you are a Knicks fan then you know EXACTLY what I mean. I am also intrigued to see how many more tricks Phil has up his sleeve. I wouldn’t be surprised if he finds a team with plenty of salary cap space to take on Amar’e Stoudemire or Andrea Bargnani a year earlier than anticipated. 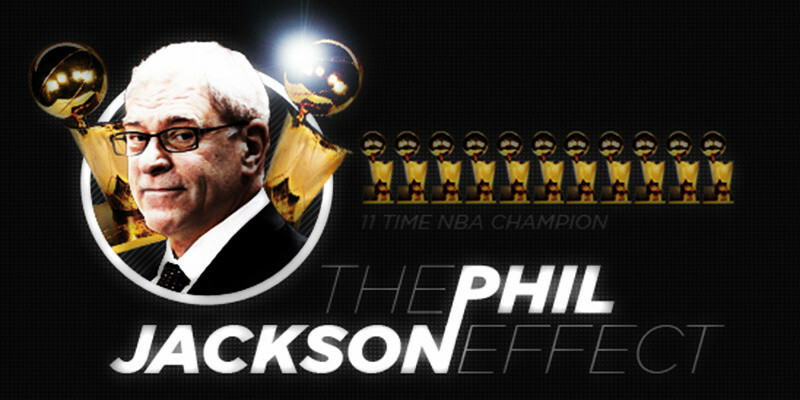 This would give Phil immediate flexibility to chase free agents. I think the moral of the story is: Never Doubt The “Zen Master”. Ok Dave, The Prognosticator of All Sports Prognosticators, can you tell who you think Phil the Magic Man will choose tonight? Do you think he has already made some behind the scenes, closed-doors trades so he will get a better center? Or at least a center in training so that when Delembert’s contract expires he already has an experienced and groomed player? Interesting…. keep writing…..would love to find out what you think about why basketball season runs on and on and on and why hockey season goes on and on and on. Seems to me like this is creating a lot of disinterest in all sports these days. Let’s go back to the way it used to be with clearly defined seasons so sports are not all melded into a big glob of who cares!